Just when you thought Yoplait had all varieties of yogurt covered, they come up with something new. The latest Yoplait yogurt product is Yoplait Greek yogurt. This new fat free product provides 23% of the daily recommended amount of protein per cup. Yoplait Greek comes in four varieties . . . strawberry, blueberry, honey vanilla, and plain. This yogurt has a texture similar to cottage cheese, so it would be perfect for using as a cooking ingredient. 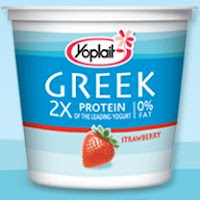 You can find Yoplait Greek yogurt recipes for appetizers, entrees, baked goods, and desserts on YoplaitGreek.com . Yoplait Greek yogurt is available at Stop & Shop and most places where Yoplait products are sold. Click on this link to snag a $.30 coupon off one cup of Yoplait Greek. That's $.60 off if your supermarket doubles coupons under $1.00 . Thank you to MyBlogSpark for providing a sample gift pack (yogurt, gift card, and product information) on behalf of Yoplait and Stop & Shop free of charge to base this review upon and for providing an additional prize pack for our contest prize. One lucky reader will receive coupons good for 4 free cups of Yoplait Greek yogurt plus a $20 Stop & Shop gift card to try out one of the recipes. Scroll through the list of recipes found on the Yoplait Greek website. Then leave a comment telling me which recipe looks like something you might like to try. You MUST do this to be eligible to win this contest. 3) For 10 extra entries, blog about this contest linking back to this post AND YoplaitGreek.com . Then come back here and leave TEN separate comments with the link to your blog post. This contest will be closed on Monday, April 12th, 2010 at 11:59pm EST. A random number drawing will be held shortly after. The winner will be announced here and will be contact via email or through their blog. If the winner does not respond within 48 hours, a new number will be drawn.